The New Carissa grounded in Coos Bay, Oregon, on Feb. 4, 1999. Image credit: NOAA. I was based in Seattle but happened to be in Portland that morning, and quickly changed plans and caught a flight over to Coos Bay. Also on the flight was a team of local salvage experts trying to get a plan together to pull the ship off. The storms kept the local tugs in port and by the time a larger seagoing tug reached the site from the Columbia River, the ship was high on the beach. Although the ship was empty of cargo, it had about 400,000 gallons of oil onboard including about 350,000 gallons of heavy fuel oil. Normally this oil is heated and pumped with the ship’s machinery, but the oil quickly cooled into a viscous mess. After a week of trying to get the heavy oil off the ship, the ship’s engine room was flooded and it was essentially a total loss and not worth salvaging. One of my colleagues who went on board said the entire ship was flexing and it sounded like being inside of a giant aluminum can being torn apart. 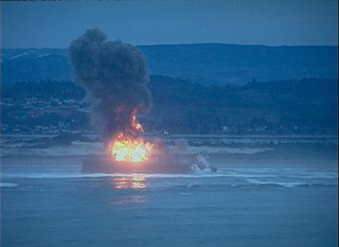 The New Carissa after ignition of fuel remaining on board, Coos Bay, Oregon. But what about all that fuel? The Unified Command made the decision to burn the New Carissa. Burning has been used before, but usually in remote areas like the Aleutians. Some fuel did burn, but the explosion and fire also caused the New Carissa to split in half, spilling even more of the fuel. Winds and surf slowly moved the bow section, but the stern was essentially anchored by the heavy and flooded engine room and giant rudder and propeller. By late February a decision was made to tow the bow section out to sea and sink it. 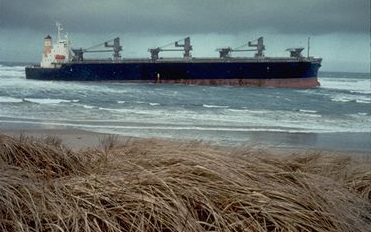 As the freighter was being towed on March 2, another storm broke the towline. The bow of the New Carissa drifted back to shore and landed up the coast at Walport, Oregon. I had just gotten home when I got the call that the bow was again ashore. By March 9 authorities were able to re-attach the towline and drag the bow almost 300 miles offshore. The plan was to scuttle the bow using explosives, but it would not sink. Winds slowly began to carry the ship back to the coast. After 69 rounds fired by a navy destroyer, the U.S. Navy submarine “Bremerton” finally sank the bow with a torpedo. After a nine-year legal battle, the stern of the ship was finally cut apart and removed in 2008. Ultimately, the U.S. Coast Guard determined that about 70,000 gallons of oil spilled, 200,000 gallons of oil burned, and 130,000 gallons sank with the bow. Since that time, emergency towing procedures and specialized pumps have been developed to better respond to similar events. To learn more about the New Carissa response, visit our fact sheet “SMART at the New Carissa Oil Spill” [PDF]. Well the reason the ship "sounded like an aluminum can being torn apart" is because the ship was being torn apart. You could see daylight through the fracture that was working its way around the hull. There was only about 50 ft left of intact hull before the ship was torn completely in half. And that was before the fire and explosion. The explosion did not "cause the New Carissa to split in half" it was just a matter of time. Thanks for perpetuating the myth that just won't die. "Yes, we should have been more precise in drafting that section about the ship breaking up... The incredible grounding forces on the ship, along with continued seas and storms had caused extensive fractures in the hull. The weather forecasts did not look any better, and that was why the Unified Command was working so quickly to implement the burn plan because it was only a matter of time (maybe only hours) before the ship broke apart and spilled its fuel oil.